This program recognizes hunters in three categories—archery, firearm and muzzleloader—who take whitetails weighing 200 lbs. or more. Only deer weighing 200 lbs. or more, and taken in New Hampshire by legal means during the open season, are eligible. All entries must be on official entry blanks provided in this book, or by the NH Antler and Skull Trophy Club (NHASTC). Weights must be witnessed by the station operator or a Fish and Game employee. All weights must be for field-dressed deer. A field-dressed animal is one which has all organs of the chest and abdominal cavities removed (including heart, lungs, intestines, etc.). The animal must be weighed intact. A deer must weigh at least 200 lbs. to qualify. The NH Antler and Skull Trophy Club coordinates this program. They reserve the right to question any witnesses, to examine the scales used for weighing any entry and to refuse any questionable application. Winners will be notified by mail following the deer season. Please supply a photo for inclusion in the next record book. Photo can be emailed to NHASTC at rblaisdell1@comcast.net. Any hunter under the age of 18 wishing to have their name published must include a parent/guardians name and signature on this form. 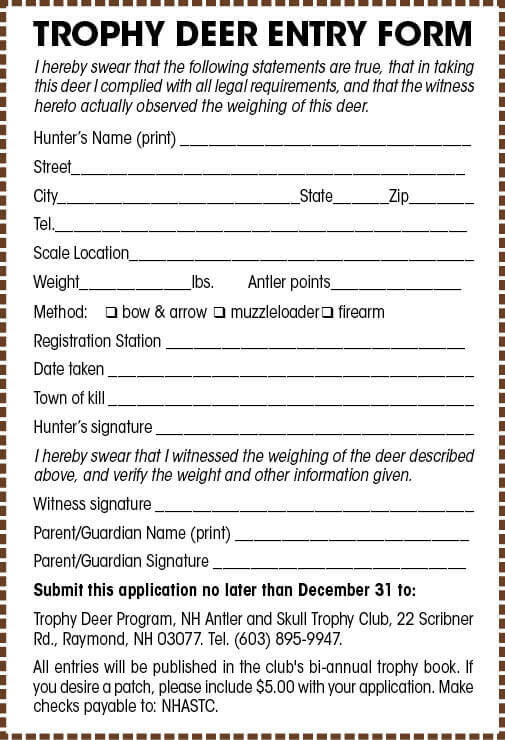 Use the Trophy Deer Entry Form, at right.